A Fond du Lac company shares its talents to benefit children battling life-threatening illnesses. Family owned and operated Natural Stone Veneers International in Fond du Lac, doesn’t shy away from helping others. When Jason Buechel was approached almost ten years ago at a home show by someone from “Believe in Tomorrow”, an organization providing hospital and respite housing to children battling life threatening illnesses and their families – he jumped at the opportunity. 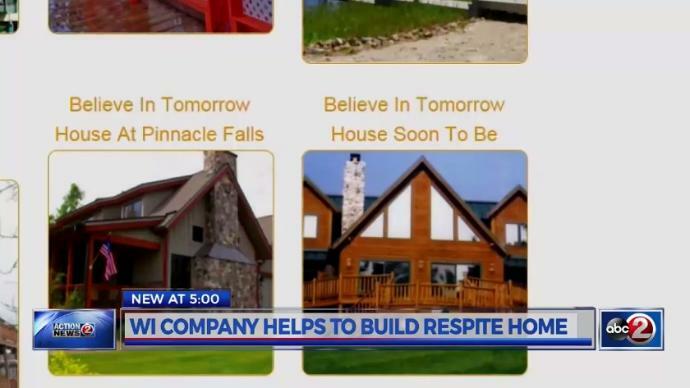 Less than a year later, in 2010, the company did the stone work on a respite home “Believe in Tomorrow” built in the mountains of North Carolina. And later this week, Buechel and a team of three others will head to Deep Creek, Maryland to work on a second respite home. In addition to the manpower, Natural Stone Veneers International also donated 20 tons of stone for the project. “This time it’s a thousand square feet of stone, interior and exterior fireplace and outside foundation wall. And we’ll work three days probably, 14 hour days and knock out,” says Buechel about the work his group will do. While the labor is hard and the work is intense, who the finished product helps makes the effort worth it.